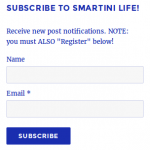 Put your name and email into the “Subscribe to Smartini Life!” form that’s on the right side of every page, and click the [Subscribe] button. Now you’re a “Subscriber” – which means ONLY that you’ll get an email whenever we post something new. It does NOT give you the ability to write Comments – but if you don’t want to write Comments, then you can stop here – no need to “Register”. If you want to write Comments, keep reading. 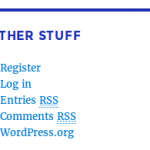 Click on the “Register” link that appears on the right side of every page, in the “Other Stuff” section. Enter a User Name and your email, and click the [Register] button. Now you’re “Registered”. You don’t have to sign in to read things, but you will have to sign in if you want to write a comment. Sorry this is necessary. 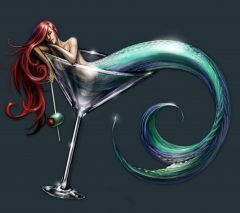 We’re using WordPress for the site, which is free, and quite capable – but incredibly, it has no built-in feature for notifying people when something new is posted. So you have to get a “plug in” – a little program that works with WordPress to add that capability. Only, it doesn’t truly integrate with WordPress – it creates its own list of “Subscribers”, separate from WordPress’s list of “Users” – and no, they don’t synchronize. That’s why you have to sign up twice, and why I had to just spend 30 minutes documenting the process. Grrrr….. But, as I frequently tell people who complain about Gmail, or iTunes, or any other free software – you get what you pay for.